Stump oedema occurs as a result of trauma and the mishandling of tissues during surgery  . After the amputation, there is an imbalance between fluid transfer across the capillary membranes and lymphatic reabsorption  . This, in combination with reduced muscle tone and inactivity, can lead to stump oedema. The complications that can arise from stump oedema include wound breakdown, pain, reduced mobility and difficulties with prosthetic fitting . Numerous interventions are used to manage and prevent post-operative stump oedema, including,compression socks, rigid removable dressings, exercise, wheelchair stump boards, and PPAM aiding. 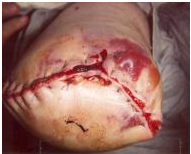 The BACPAR post operative oedema guidance (2012) details the evidence behind these interventions and recommends the use of rigid removable dressings where expertise, time and resources allow. Also according to this guideline the PPAM aid, stump boards, and compression socks have some evidence for oedema control but it is not their main function. See Acute post-surgical management of the amputee for more information. Surgical site infection after amputation is common and as well as increasing patient morbidity, can have negative effects on healing, phantom pain and time to prosthetic fitting  . Risk factors for a stump infection include diabetes mellitus, old age and smoking, which are all common denominators amongst the amputee population . The decision to insert a drain and use clips instead of sutures is also associated with an increased infection risk. At least one of the following signs or symptoms of infection : Pain or tenderness, localised swelling, redness or heat, and a superficial incision is deliberately opened by surgeon and is culture positive or not cultured. A culture negative does not meet this criterion. Diagnosis of Superficial incisional sugical site infection by the surgeon or attending physician. Infection occurs within 30 days if no implant is left in place or within one year if impplant is left in place and the infection appears to be realated to the operative procedure. Purulent drainage from the deep incision. A deep incision spontaneously dehisces or is deliberately opened by a surgeon and is culture positive or not cultered. when the patient has atleast one of the following signs or symptoms :fever (>38), or localised pain or tenderness. A culture negative finding does not meet this criterion. An abscess or other evidence of infection involving the deep incision is found on direct examination, during reoperation or by histopathological or radiological examination. Diagnosis of the deep incisional surgical site infection by the surgeon or attending physician. The potential consequences of infection include vac therapy, wound debridement and revision surgery. This can increase hospital length of stay and the risk of secondary morbidities such as pneumonia or reduced function. Wounds should be inspected regularly so that any signs of infection can be detected. Poor tissue perfusion leads to ischaemia and necrosis. Dusky skin changes, mottled discolouration and slough can be observed. This can lead to subsequent wound breakdown and dehiscence . Depending on the extent of non viable tissue, wound debridement or revision surgery is often necessary. More information on wound healing following lower limb amputation from The American Academy of Orthotists & Prosthetists. Pain is an inevitable consequence of amputation. There are several types of sensations following an amputation that should be discussed when referring to pain following amputation. Some of them are extremely painful and terribly unpleasant; some are simply weird or disconcerting. In one form or another they are experienced by most people following an amputation. Post amputation pain can be isolated to the residual limb or can occur as phantom pain. For many, pain will not just result from the trauma of the surgery, but will also include a neuropathic presentation known as phantom limb pain (PLP). When amputation has resulted from a traumatic incident, such as in a disaster setting, this can be complicated by co-existing injury to the same limb or other parts of the body. For the physiotherapists involved in the early and post acute stages of rehabilitation, the challenge is determining the nociceptive and neuropathic causes which require attention in order to manage the patient and so enable effective rehabilitation to occur. Residual Limb Pain (RLP): Patients can often feel pain or sensations in the areas adjacent to the amputated body part. This is known as residual limb (RLP) or stump pain. It is often confused with and its intensity is often positively correlated with PLP. Phantom Limb Sensation: This is a normal experience for the majority of amputees, but it is not a noxious sensation, which might be described by the patient as unpleasant. Often it can be described as a light tingling sensation, or in such cases re-assurance is the key. Phantom Limb Pain (PLP): Classified as neuropathic pain, whereas RLP and post-amputation pain are classified as nociceptive pain. PLP is often more intense in the distal portion of the phantom limb and can be exacerbated or elicited by physical factors (pressure on the residual limb, time of day, weather) and psychological factors, such as emotional stress. Commonly used descriptors include sharp, cramping, burning, electric, jumping, crushing and cramping. Musculoskeletal pain - pain from other injuries suffered during a traumatic amputation, musculoskeletal pain caused by abnormal gait patterns, pain caused by normal ageing processes, or excessive wear and tear on the joints and soft tissue of the residual limb. Neuromas - localized pain, sharp/shooting/paraesthesia reproduced by local palpation and Tinel's sign, relieved by LA injection. After amputation, it is not uncommon for patients to experience pain, muscle weakness or instability in structures not directly associated with the amputation. These compensatory structures are the muscles and joints that are required to perform additional functions post amputation, often resulting in stiffness, spasm or pain. The effects of bed rest and reduced mobility are also well documented. Deconditioning results in diminished muscle mass, sarcomere shortening, reduced muscle strength and changes in cartilaginous structures  . It is therefore, crucial, that amputee patients undertake functional rehabilitation and personalised exercise programmes from as early as day 1 post surgery. Hip flexion contractures and knee flexion contractures are common complications post amputation and can impact significantly on prosthetic rehabilitation. ROM exercises should be incorporated to avoid contractures, as well as prone lying to prevent hip flexion contractures, a sandbag could be placed next to the residuum to prevent a hip abduction contracture. A sandbag could also be placed on the lower part of a transtibial residuum when the patient is prone, to prevent hip flexion contractures..
Complex regional pain syndromes (CRPS) are neuropathic pain disorders developing as a disproportionate consequence of trauma affecting the limbs . Symptoms include distal pain, allodynia and autonomic and motor dysfunction. The residual limb can appear hot, swollen and trophic due to altered control of the sympathetic nervous system. Due to the lack of understanding about the pathophysiological abnormalities underlying CRPS, treatment should be multi-disciplinary and comprise of neurologists, physiotherapists and psychologists to name but a few. Anti-depressants are proven to be beneficial in reducing neuropathic pain  alongside nerve blocks, TENS, graded exercise and mobilisation. ↑ Engstrom, B and Van de Ven, C (1999). Therapy for Amputees. Churchill Livingstone. ↑ Ottobock. Muscle contractures after amputation. Jan 2019. ↑ 19.0 19.1 Li Y, Brånemark R. Osseointegrated prostheses for rehabilitation following amputation. Der Unfallchirurg. 2017 Apr 1;120(4):285-92. ↑ 20.0 20.1 Atallah R, Leijendekkers RA, Hoogeboom TJ, Frölke JP. Complications of bone-anchored prostheses for individuals with an extremity amputation: A systematic review. PloS one. 2018 Aug 9;13(8):e0201821.